This plant grows to be about 6-8" tall. It keeps its color in indirect light or under fluorescents. Variegation can be white or pink. Don't let it dry out; it's a dramatic flopper. This plant is a living sculpture and deserves a better photograph. It flourishes in a bright northern window and if your northern window isn't bright, it will still put on a decent show. P. selloum gets big: 2' tall x 2' wide. I won't listen to a bad word about this plant! If you don't like it, it's because you haven't seen it used properly and grown well. This plant is a trouper: it's sturdy, architectural, 2-3' tall, and if you keep it on the dry side it grows well in very low light. This vine makes a superb living curtain. 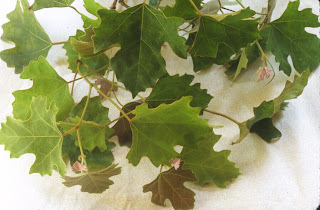 It's drought tolerant, grows in low light, and new leaves have a swell reddish variegation. Look at the common name. This plant survives dark, cold, dry places. Don't overwater it and A. elatior will be your pal for years. What should the next Top Five be? Flowering houseplants? Vines? Drought tolerant houseplants? The choice is yours. 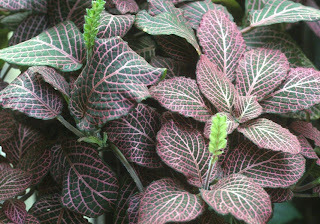 i am a huge fittonia lover...i tell everyone i know about how great they are! i wish a could put one of those watering globes in mine, but they just don't grow large enough to support the weight of the glass filled with water...they end up sticking up too high or tip the pot over! I suppose I could move them to heavier pots though! Have a happy day! A clay pot might help keep the plant from tipping under the extra weight, but a plastic pot keeps the soil moister longer...hmmm...how about putting a Fittonia potted in plastic INSIDE a clay pot for a little extra heft? Sara, when you're ready to try let me know and I'll start a cutting for you! 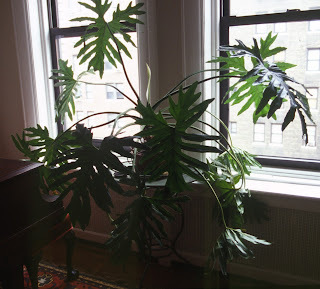 Is the photo of the Ficus pumila inside your apartment? I have loved the way that this southern plant tightly clings to walls as it climbs. I tried to train it to climb up the wall in a bathroom with only a sky light. Consistent problems with botrytis made me abandon the effort. I am now growing Pothos. Can you suggest other small-leafed plants that cling and climb? No, the Ficus pumila isn't in my apartment; it's inside a terrarium that I designed and installed for a client in the city. The only light comes from 4 fluorescent tubes. I would think a terrarium would be more humid than a bathroom, but I've never had any trouble with botrytis. In Britain we call the Sanseveria 'mother-in-law's tongue' possibly due to it's sharp shape! I like the look of the S.cylindrica but haven't used them in any of my office displays as yet. I've also made a 'Top...' it's www.toptenofficeplants.co.uk. 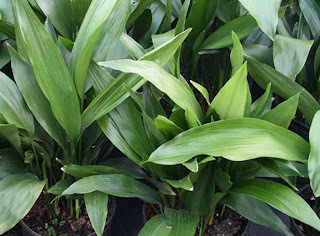 I have found these plants to be the best for offices from a maintainers point of view. We have to consider the low natural light levels in offices and how long they will last. Longer lasting means more profits! Regards, Keith. Ooo, Keith, S. cylindrica is one of my favorites! After looking at your containers, I think you could make magic w/ S. cylindrica. Try it and send me a picture! I must re-comment, because the R. capensis you gave me is the star houseplant of our house... so easy, so lovely!